Both the decimal and fraction represent the same thing, they are not whole numbers and one form can be changed into another form. Decimal to Fraction charts and Decimal Place Value Charts enables the students of higher mathematics to quickly get the fractional values of the most conventional decimal numbers. 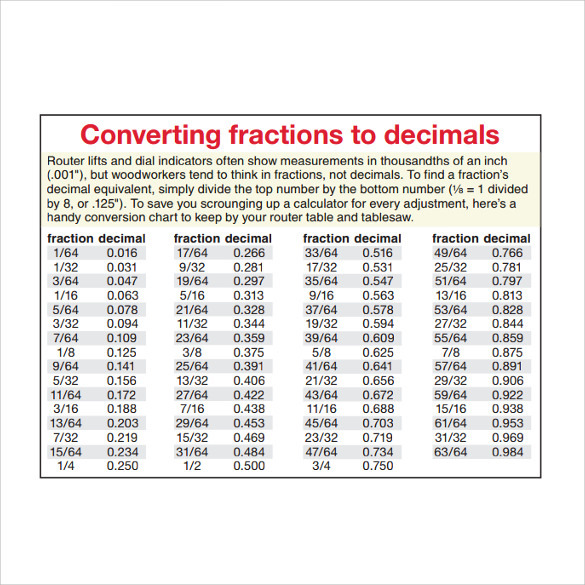 Though a student of mathematics knows very well how to convert a decimal number into a fraction, but in some special situations like in repeating decimals the conversion can be easily calculable with the use of this decimal to fraction Chart Template. The Chart Templates and the instructions given with the charts are very helpful in getting values of decimal numbers in fractional terms. This template is helpful for school going children to ease their calculation. Almost all generally used fractions have been converted to decimal and presented in a tabular form. The formula used for conversion has also been mentioned. This will save your time that you otherwise would have used for calculation either manually or using calculator. Do calculations scare you? If so, then this chart is tailor made for you and will help you to get over your fear of calculations. This easy to use handy chart can be used by anyone. In this char, the most commonly used fraction to decimal conversion is highlighted in a bigger font. This chart is a bonus in itself. It has three types of conversions detailed in it which includes fractions, decimals and percent. 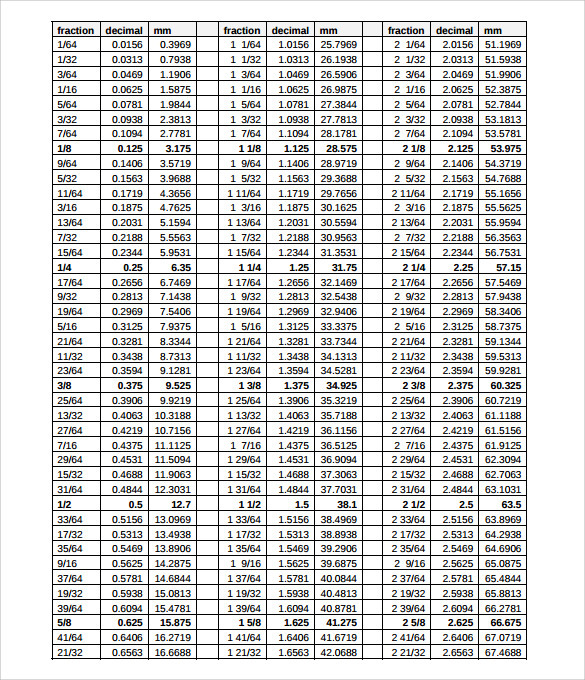 All the mainly used fractions have been converted to decimals and percent and given in an easy to read tabular form. Calculation the given millimeters into decimals and fractions is a herculean task. Not only does it look scary, it actually is very difficult to calculate. This chart will help you ease your burden as here you just need to locate the required block in the chart and your answer will be in front of you. This document teaches the technique of decimal conversion rate. As per the chart, one just has to insert the numbers in order to get the desired conversion rate. This document can be customized to suit specifications. 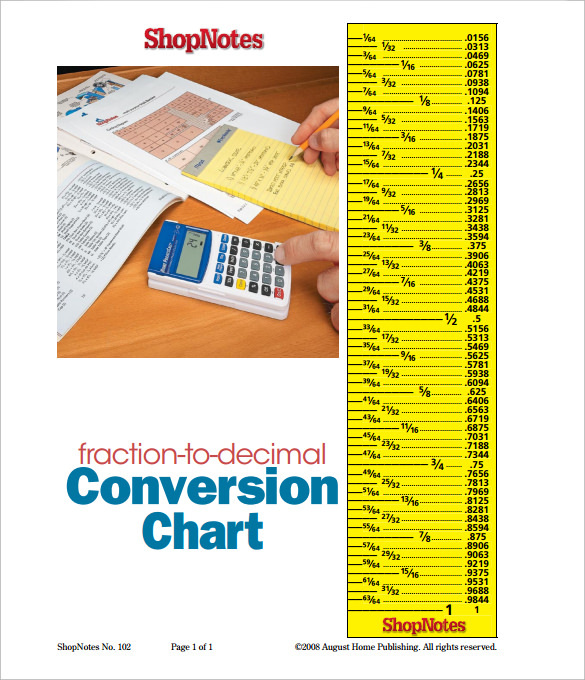 The fraction decimal conversion rate chart is FREE for download. It comes in both pdf and word format. This document helps to convert a number into fraction. This chart teaches the technique of doing so. It is used mainly by educational institutions. 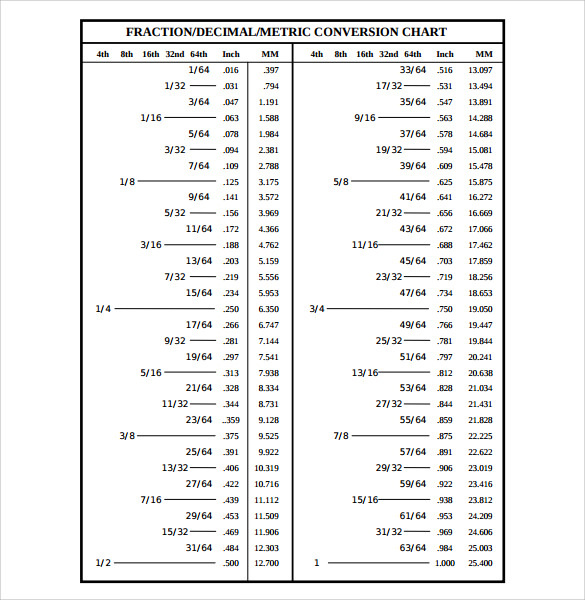 The fraction conversion chart is easy to use. It can be downloaded for FREE in both pdf and word versions. It can be saved for later use as well. This document is used in educational institutions. It helps to convert a fraction to decimal points. The chart highlights the formula of doing so. The formula is highlighted in different colors. 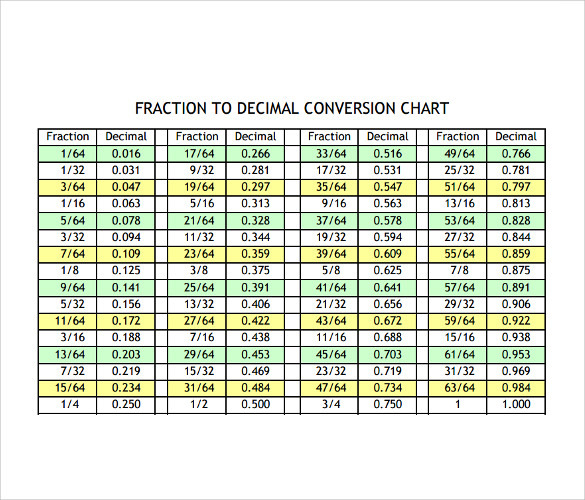 The fraction to decimal conversion chart can be used in either word or pdf format. It is FREE to download. 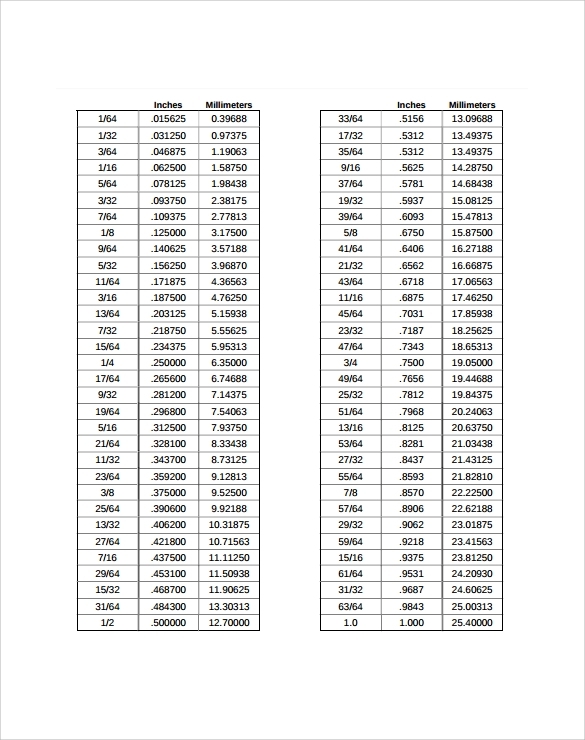 Why do you need Decimal to Fraction Chart Templates? If you are the one who deals with calculations throughout the day, then this chart will help you get accurate results in no time. Calculating manually will eat away your time like anything and will definitely make you feel mentally tired. So, you can always use this chart and finish up this exhausting task in no time. You will not even need a calculator when you have this handy. 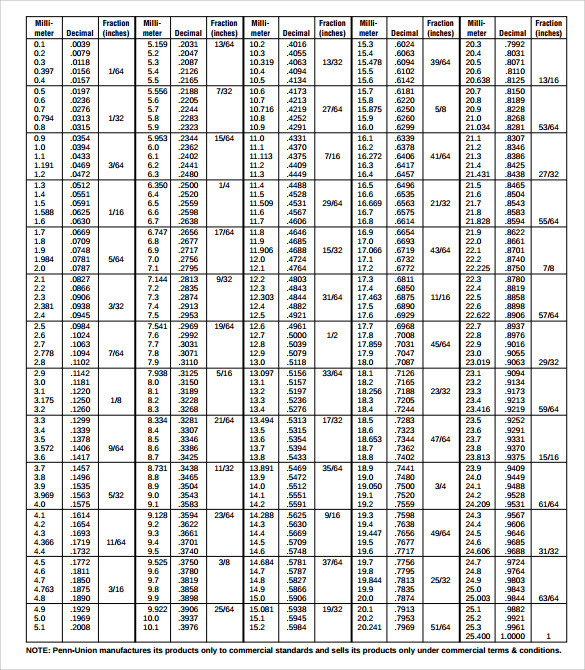 Decimal conversion requires a lot of precision which is only possible when you have such a table in front of you. These Conversion Table Charts have been made considering the basic calculation requirements in mind. 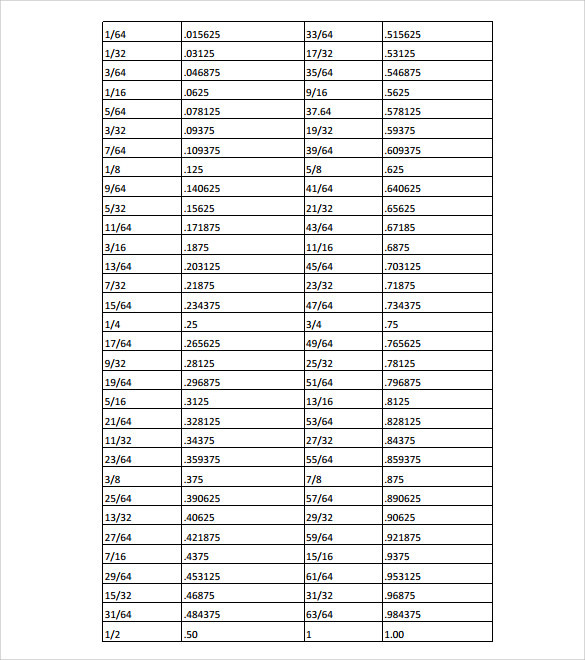 When do you need Decimal to Fraction Conversion Chart Templates? You need this conversion chart to save your time. Many people are scared of mathematics as it involves a lot of calculations. Such a table will be a boon for them. The chart solves the basic problems of decimals and fractions and gives student an idea to solve minor problems in no time. With the provision of decimal to fraction conversion chart, minute troubles of mixed fractions, complicated decimal equation and percentage problems are solved. You may like Temperature Conversion Charts. A decimal to fraction conversion charts helps the students to get the converted values easily without putting in more effort and time. A student of mathematics does know how to calculate these values, but to be on the safer side, it is good to use such a chart. This chart will also make it easy for teachers to make the students understand the calculations in a better way. Also, this table can be used by businessmen to prepare reports easily where accuracy as well as speed is required. Such a chart can also be used by chefs and baking professionals to get the accurate measurements of all ingredients. 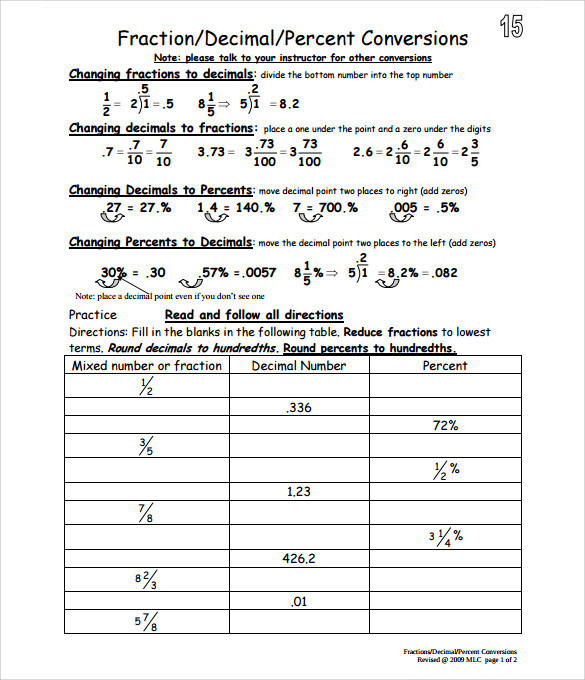 These templates teach the way in which decimal values can be converted into fractions easily. They not only give the values but also display the formula with which the values have been calculated.